A Florida Keys Vacation You Won't Soon Forget Captain Pip's Marina & Hideaway in Marathon, Florida Keys (Mile Marker 47.5) is known for its spotless accommodations and friendly island atmosphere. Located on Florida Bay a half mile from the Seven Mile Bridge, there's easy open water access to the bay and the ocean. We offer quality Florida boat rentals, beautiful Florida Keys accommodations in our tropical vacation suites, as well as world-class sport fishing with our Florida Keys fishing charters and guides. The bayside harbor includes Porky's Bayside Restaurant, where you'll enjoy all-American Bar-B-Q and fresh catch seafood with live music in a casual, tropical, on-the-water setting. Our unique location has hosted famous Keys visitors since the 1950's - including such notables as Ernest Hemingway and Jimmy Hoffa. Visit our small resort and make Captain Pip's your Florida Keys accommodation and fishing vacation hideaway. Would you rather see the fish? Captain Pip's also offers the perfect Florida Keys dive vacation for our customers interested in snorkeling or SCUBA diving in the Florida Keys. Our Florida Keys vacation rentals with boat make it possible for all members to enjoy the beautiful tranquility that the Florida Keys have to offer. -Bahia Honda State Park â€“ these beaches (on the ocean and bay side) are ranked among the top ten most beautiful beaches in the U.S. â€“ crystal clear waters, soft sand and a remote location at the western point of the Seven Mile Bridge â€“ are well worth a visit. -Crane Point Hammock â€“ 60 acres of tropical hardwood hammock exist as it did 300 years ago. The hammock is similar in many ways to the tropical rainforest â€“ a variety of species call the hammock home. This non-profit Nature Center has touch tanks, interactive exhibits, a historic Bahamian house and a Wild Bird Rescue Center to occupy the minds of both young and old. Diving & Snorkeling â€“ dive into the waters off Marathon and youâ€™ll see the underwater equivalent of the tropical rainforest. Four miles offshore, Sombrero Reef Light tower â€“ a marine sanctuary -- straddles dramatic coral formations that are home to parrotfish, angelfish, sergeant majors, yellowtail, lobster, crabs, and hundreds of other species. -Dolphin Research Center â€“ "Dolphin Encounter", a half-day program focuses on dolphin communication and includes a hands-on session that gives you the opportunity to talk to and swim with the dolphins. And the Dolphin Splash, half-hour program lets you swim with the dolphins. 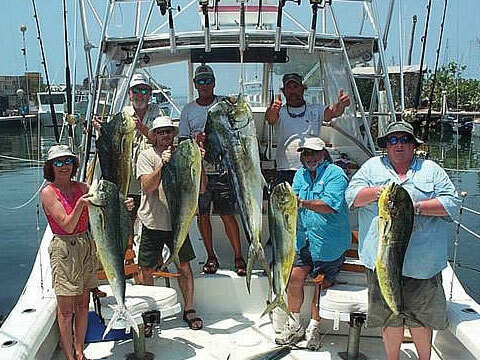 -Fishing â€“ the variety is the best in the Keys. The hottest ticket in town is Marathonâ€™s explosive sailfish, mahi mahi, and tarpon fishing. Offshore, reef, bay, flats, backcountry, charter, and bridge fishing offer plenty of action, as well â€“ all minutes from our dock. -Old Seven Mile Bridge â€“ a great place for a walk or bike ride and the sunsets are among the best in the Keys. Schools of big tarpon as well as other game and tropical fish seek the shade of the bridge during the day â€“ look over the railing and see for yourself. -Pigeon Key â€“ Henry Flagler used this island in the middle of the Seven Mile Bridge as base camp when his overseas railroad was built. Today some of the original structures remain and visitors are welcome to explore the island at their leisure. Captain Pipâ€™s boats are welcome at the Pigeon Key dock and our guests say itâ€™s a great place for a picnic.